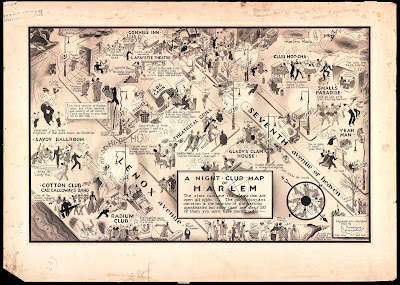 This map was created in 1932 by E. Simms Campbell, the first nationally syndicated African-American illustrator in the United States. 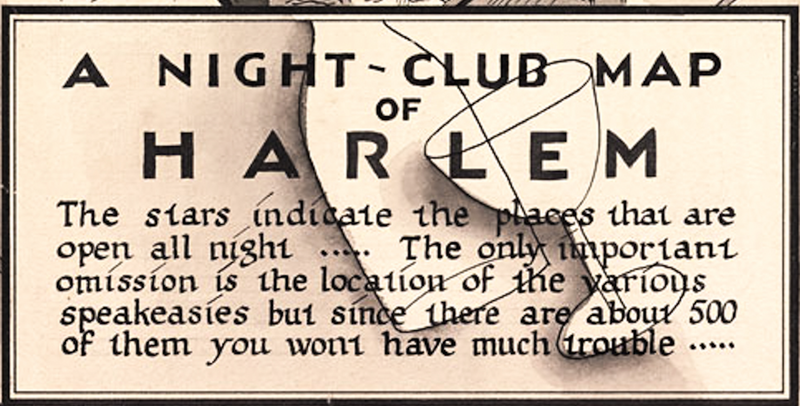 It appeared in the first issue of Manhattan Magazine, and was republished nine months later in Esquire. 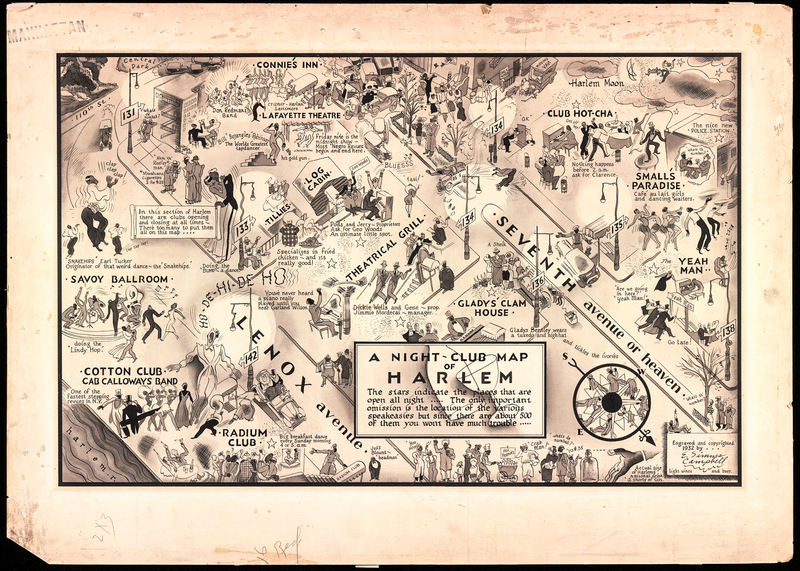 The map features the most famous speakeasies and night clubs of Harlem (but not all of them as indicated in the title block below) during the Prohibition era. For example "Gladys'" (Harry Hansberry's) Clam House where Gladys Bentley, who performed as a cross dressing lesbian, "wears a tuxedo and high hat and tickles the ivories." 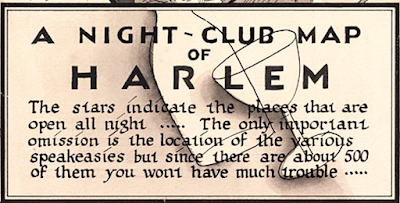 The map is full of charming details such as "Seventh avenue or heaven", various famous personalities like Cab Calloway and Bill "Bojangles" Robinson, an "actual size" picture of a "shorty" of gin, Harlem's "national drink" and this unique north arrow. 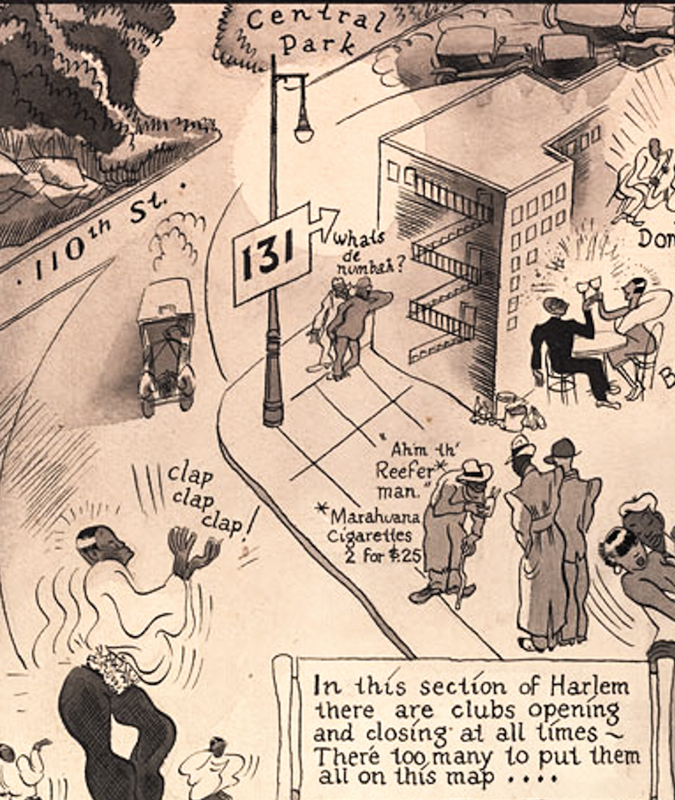 The map also takes some interesting cartographic liberties such compressing the blocks along Lenox Avenue in order to reach up to the Cotton Club. 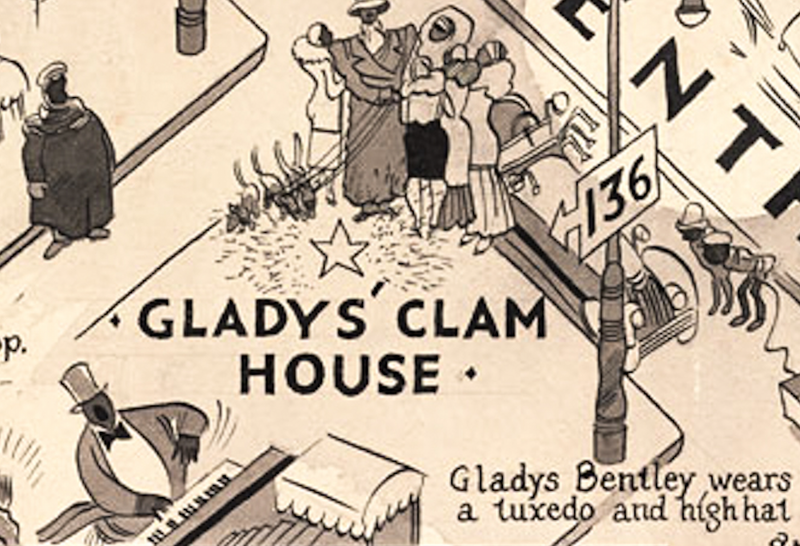 The numbered streets are also deliberately misaligned on either side of Seventh Ave in order to emphasize the important clubs. 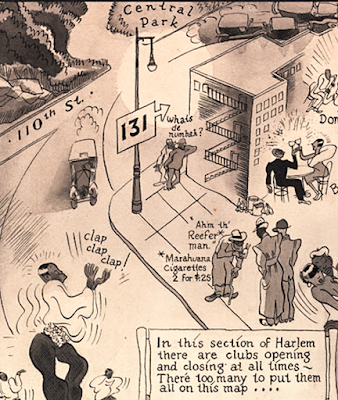 The blocks between 131st and 110th street are compressed to allow Central Park to be shown. 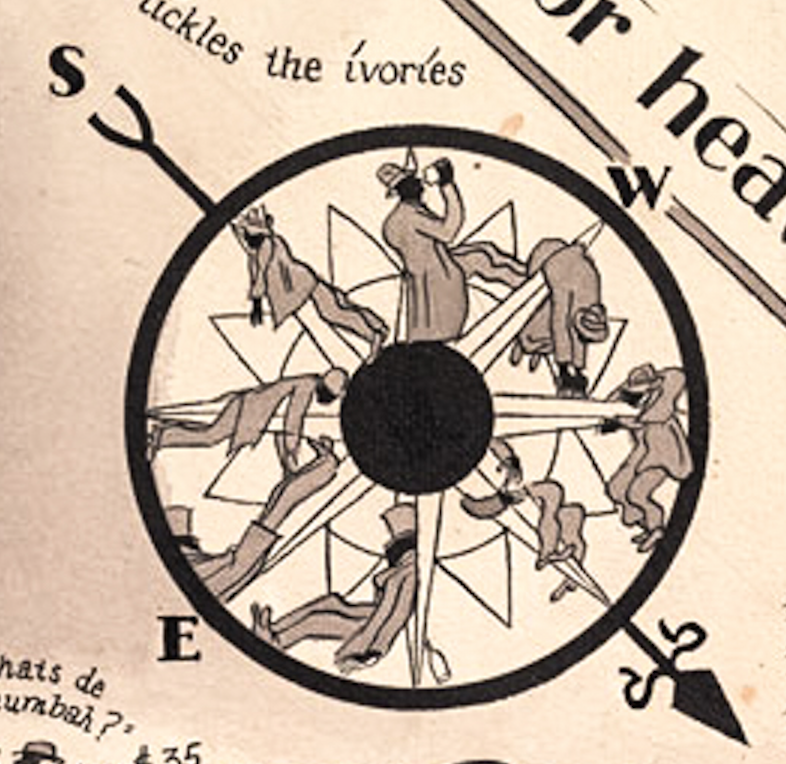 The map, along with additional details can be found here. A full resolution version can be found here. Nice Collection of post you have post here, Thanks for sharing such great information with us. Your Post is very unique and all information is reliable for new readers. Keep it up in future. What is Map of the Week? A brief description and boring history lesson. The Number 2 Cartography Blog! Cartographer/GIS/map nut by trade originally from Philadelphia now living in exile outside of Boston, Mass.